There are three main aspects to packaging for ecommerce shipments. Protection. Helps prevent damage to the items during transit. Presentation. Gives perceived value to the customer. Cost. Often a limiting factor. In this article, I will address “protection” matters: How to prevent a shipment from being damaged during transit. When considering protection, it is worth considering that it is nearly impossible to have no damages in shipments — without excessive cost. There has to be a compromise between an acceptable number of damages compared to the cost of additional packaging. That balance varies greatly among companies. It is dependent on the value of the item, the value of a customer’s repeat business, and the ease with which a replacement can be sent. There is no point triple-wrapping a USB cable, for example. But an urgent, high-value machine part might benefit from a paranoid level of wrapping to ensure the customer has it on time and not damaged. Consider how the parcel be handled and what you should protect against. Postal and carrier workers will throw light parcels when sorting. Parcels will drop down chutes and possibly fall from conveyors. You should prepare items to withstand at least a 3-foot —roughly 1-meter — drop onto concrete. Expect your packages to get briefly rained on, slid around the van floor and stacked beneath other packages. If your parcel is traveling outside of the country, expect it to get dropped and bumped more than once. There are a variety of packing materials designed to protect against different types of abuse during shipping. First, consider why items break and how you can prevent it. 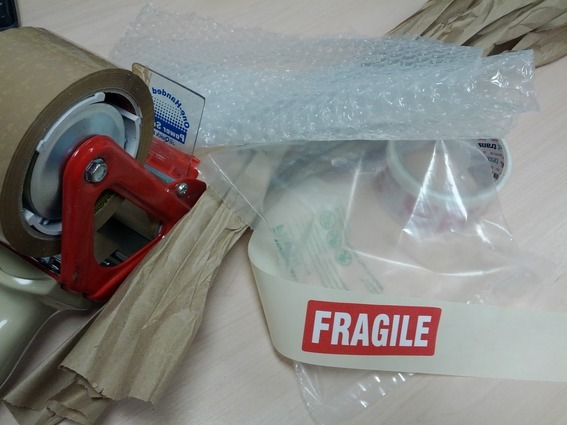 Fragile items can get damaged by impact or by stress and torsion. Packaging, therefore, needs to have both damping against impact and, also, structural rigidity. Remember, too, that products can damage themselves and can still break, no matter how good the outer box. To prevent this, make sure that nothing can move within the package. Glass is a good example of this. It is incredibly strong but very brittle. If glass jars are stacked in an ordered way and packed tightly together in a box, you can easily stand on it and it will withstand impact. There’s no need for padding between the jars as they can’t strike each other. If they are loosely arranged in a box, however, they will hit each other and smash, even if surrounded by heavy packaging. For packing and shipping, you need “outer” materials, “impact protection” materials, and “void fill” materials. I’ll describe options for each, below. Polybag. Very cheap and offers excellent tear and water resistance, but offers no other protection or structural strength. Polybags are very easy to throw, so they may get rougher handling when being sorted. Polybags are suitable for items that are already well boxed — but require more confidentiality — or for soft, non-fragile items. Jiffy bag. Cheap and offers similar protection to polybags, but with some added cushioning against minor impacts. Jiffy bags are suitable for smaller, non-fragile items that benefit from a little protection. Single-wall corrugated box. Cardboard prices have risen substantially over the last 12 months. But cardboard is still very economical packaging. Cardboard is structurally strong. It offers good impact protection and surprising resilience to short periods of rain. Double-wall corrugated box. Made with two corrugated layers that offer additional rigidity and impact protection. This is particularly suitable for very fragile or heavier orders — more than 20 pounds, or 10 kilograms — where a single wall box is likely to deform when lifted. Book wrap. The Amazon-style packaging is ideal for books, DVDs and smaller flat items. These are quite expensive, but they still offer value for high-end books or long-distance travel. Card envelope. This is the new favorite for small books and DVDs. Card envelopes are much cheaper than book wraps. The protection level is quite low, but it prevents damage to corners of books and DVDs. Kraft or brown paper. Use this scrunched up into sausage shapes and zigzagged across and around the item. This provides excellent protection and is easily reused or recycled by the recipient. Note, however, that on long transits it can collapse under heavier loads. Bubble wrap. Can be quite expensive, even if bought on trade-sized rolls. It’s very good where an item needs complete coverage against impact protection, such as glass. For other purposes, brown paper is usually more effective and less expensive. Even after long transits, brown paper maintains good protection if used several layers thick. Some manufacturers make bubble wrap that you can tear in a perfectly straight line. This saves much time and eliminates the need for scissors and knives. Corrugated roll. Single-ply corrugated board on a roll. This can be used for lining thinner boxes to increase their impact resistance, or for wrapping around bottles. Corrugated board can collapse under heavy loads, but it has the advantage of having some structural integrity that prevents dents and bending. Specialist protection. There are a number of other high-protecting items available. These include self-activating foam bags that mould and set to form a perfectly shaped cradle. They offer the very highest level of protection, but have a price tag to match. Kraft or brown paper. If more loosely scrunched, this can be used to stop smaller items from moving inside the box. It is cheap and effective, but won’t hold up against heavy items. Air cushions. These are small air filled bags that are nearly strong enough to stand on. They can be inflated on site to reduce storage. The only disadvantage is that the inflating machine can be expensive to purchase, though many suppliers will lease you one for free if you buy their product. We use them frequently in our fulfillment center. Loose fill. Foam chips or packing “peanuts.” These are the bane of our lives. They are expensive, take up huge amounts of space, and end up all over the floor. It best to avoid these. No customer over the age of 12 enjoys cleaning them up. If you choose the right suppliers, you’ll be able to find all the materials above in various recycled and biodegradable forms. Remember, however, that the most environmentally friendly method is to use less packaging, as even recycled materials emit CO2 when they are processed.